Store and retrieve messages in a central repository with SMS using Twilio and ASP.NET. This project enables an individual use a mobile phone to store a short message "in the cloud", that can be picked up by others using their mobile phone. have some political fun along the way. Before we get started, see the application in action. Using your mobile phone, SMS (text) bush to +1 530 PROJECT (as in Code Project, or +15307765328). Note: The demo does not allow addition/change/deletion of messages. My softball team had a problem. If a game was cancelled or rescheduled due to rain (or hail), it was difficult to relay the message to all the players quickly. They would drive to the ball park, only to learn about the cancellation. 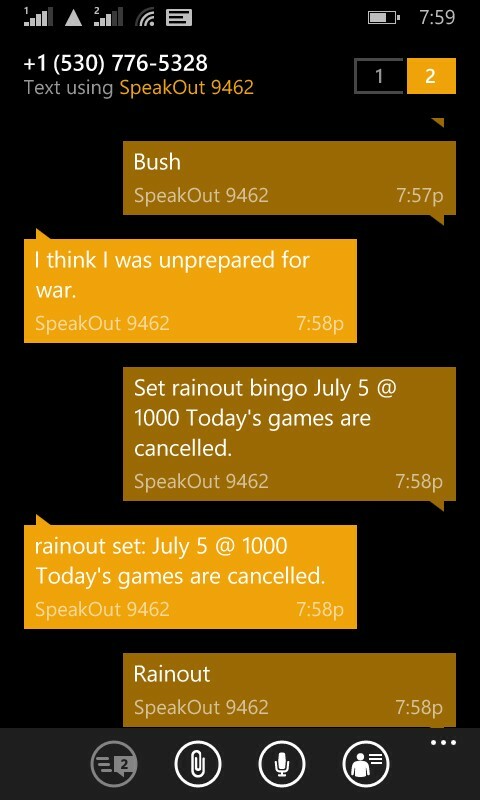 set rainout bingo July 5 @ 10:00 Today's games are cancelled. rainout set: July 5 @ 10:00 Today's games are cancelled. July 5 @ 10:00 Today's games are cancelled. Twilio is a telephony gateway. It bridges data and voice between the internet, POTS, and 3GPP networks. By setting up an account with Twilio, calls and messages be be directed to and from an assigned number. A phone number is associated with a web application by specifying the URI of the application. When the number receives a message, an HTTP POST is made to the specified URI as application/x-www-form-urlencoded, containing data and metadata. The application responds to the request with an XML document (TwiML), containing instructions on how to respond. The response is relayed back to the requestor. In this example I have used IIS/ASP.NET to act as the HTTP server and scripting interface. Incoming requests are handled by overriding the Render method of the Default Page class. If a form is POSTed with a Body parameter, the Controller is invoked. set greeting bingo Thanks for stopping by! ParseTwilioRequest uses a regular expression to split the message into its components. // Parse the twilio request. A verb/instruction. This is the only required component. Valid commands are any stored key, hello, ping, set, delete, and bush. If performing a set or delete command, a password is required. The password is specified by Repository.Password. If performing a set or delete command, the key of a key/message pair. 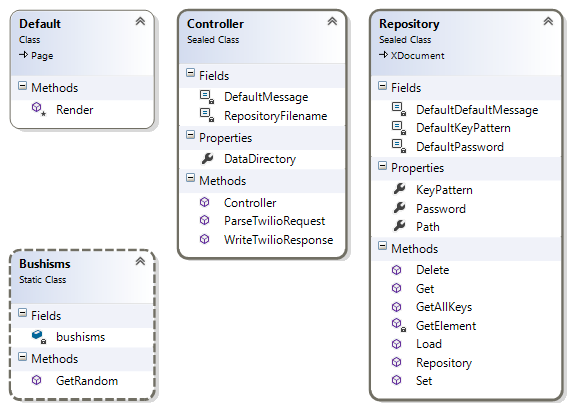 The key must match a pattern, specified by Repository.KeyPattern. If performing a set or delete command, the message of a key/message pair. If no components are present, or the command is invalid, a default message is returned. The application uses and XML file as a data repository, abstracted by the Repository class. It subclasses XDocument, and provides properties and methods to manipulate its data. Just for some fun, a bush request invokes Bushisms.GetRandom() for a random Dubya quote. Copy the provided files to your web server. Open a Twilio account (you'll receive some free credit). In the telephone number configuration, assign the URI of your application the to the SMS callback. Test, and use Twilio's alerts panel to debug. about USD 0.0075 (¾¢) per message sent or received. The password, used to set and delete messages is stored in plain text in the repository.xml file, so are the messages. To secure the application, it should be configured on a server that uses SSL/TLS (HTTPS) to encrypt the transport of messages between Twilio and the web server. By design, messages can be retrieved from the store using only a keyword. How could you use this application? What other use cases can you imagine? Add your response below. This project demonstrates how to build a simple SMS application without the use any external libraries or dependencies. I am not affiliated with Twilio. This article is not an endorsement for Twilio. Twilio is one telephony gateway, and there are many others. Each may offer different services, at different costs. Note: Offering a working demo for this article has real costs. The cost of this demonstration is sponsored by Red Cell Innovation Inc. If you require development of a telephony or mobile application, please consider us. He is a Certified Technician (C.Tech. ), a professional designation granted by the Institute of Engineering Technology of Ontario (IETO). Yvan draws on experience as owner of Red Cell Innovation Inc., Mabel's Labels Inc. as Manager of Systems and Development, and the University of Waterloo as Information Systems Manager. /KB/applications/996504/RedCell.Web.SmsRepository.zip appears to be missing on our servers. D'oh. I see the same thing as well. Thanks for letting me know, resolved. hello source code file link broken.